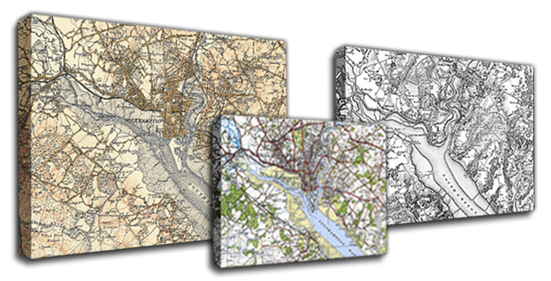 These elegant canvas prints provide a contemporary format for your personalised historical map. Printed on canvas paper and protected with a satin finish, the image will not fade in normal display conditions. The print is gallery wrapped (with the canvas securely attached at the rear) over a 1.5” (40mm) frame and arrives ready to hang. Choose from seven different mapping series dating from 1805 to the 1940's.